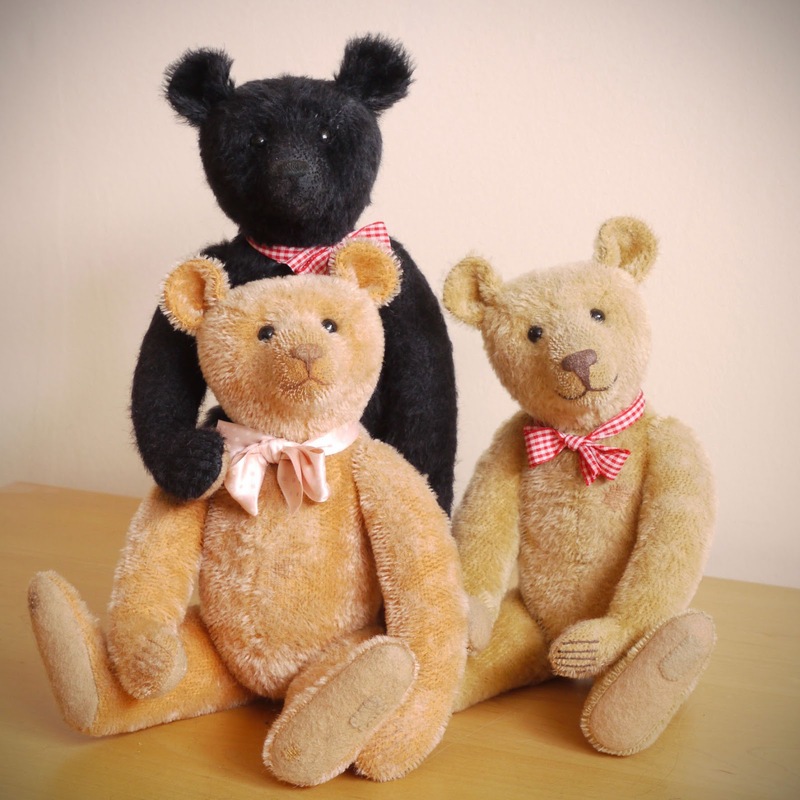 I have made classic looking bears with various degrees of care wear, gentle fatigue or hand distress finishes over the years. I like them to look a little lived in and I am also quite particular about the way they feel, I like them to be light, a little saggy and crunchy just as a real old bear might look and feel after many years of duty as a Ted. Until now I have resisted the temptation to take the distressing and fatigue to the distinctly worn look. The pattern has been revised and these new bears are just over 11 inches tall so one of my smallest bears. The big move is to make them very threadbare, heavily worn and with repairs. The pile is worn away in many places and the holes repaired with darning, I used examples from real old bears which showed rather crudely mended holes, and resisted the temptation to make anything too neat and regular. The felt pads have some patches and some darned holes. The stuffing is moderately firm but I have made it crushed and loose at the neck and on the tummy, so they are a little saggy but with the distinct crunch of wood wool filling. 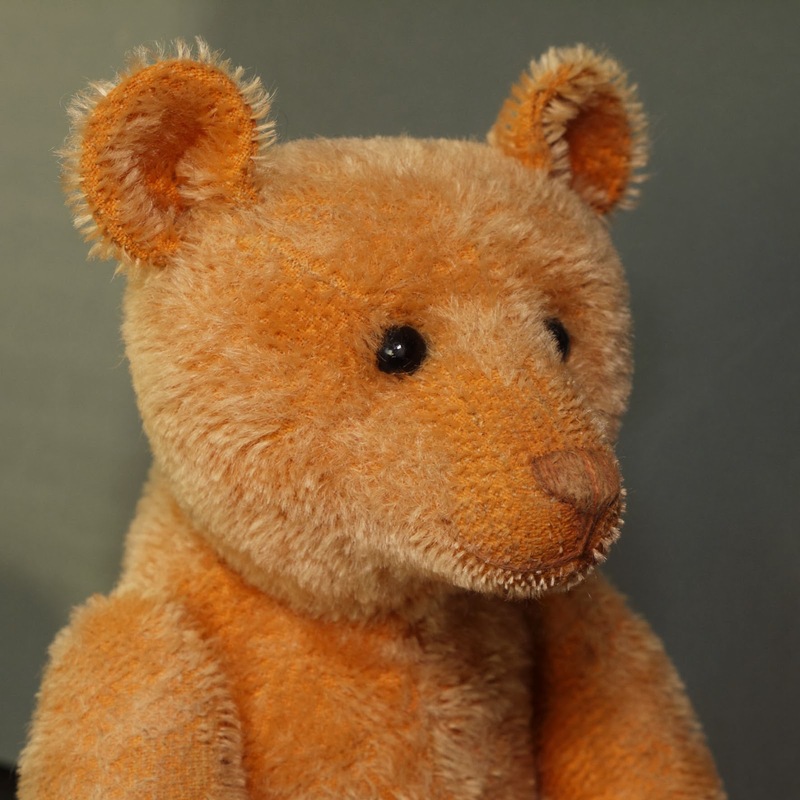 It's quite time consuming because I do all the wear and repair after the bear is finished, each is very much an individual, and I have enjoyed making all the little repair areas and try to blend them in so they look as if they too are old repairs which have simply become part of the bear's character.